North Carolina is ranked eighth in the preseason AP Poll, which is good. But there are reasons to believe the Tar Heels can outperform that projection. We took a deep look at their lineup and this is one team we won't be surprised to see in the mix come March. Here’s why North Carolina could end up in the same tier as Kansas, Kentucky, Gonzaga and Duke by the time the season ends. Luke Maye is a legitimate top five player in the country, and a senior. It’s good when your best player is experienced. Maye averaged 16.9 points, 10.1 rebounds and 2.4 assists per game last year on high efficiency; he made 48.6 percent of his field goal attempts and 43.1 percent of his 3s. He’s arguably the best shooting big man in the country. And then there’s freshman Nassir Little, who has a chance to wind up as the best newcomer in the country. Little is the total package. He’s big, athletic, skilled and plays with a high motor; Little should really help a North Carolina defense that finished 38th last year. The Tar Heels’ top two players stack up against anyone. They’re on par with Duke and Kentucky in that regard, and are probably better than Gonzaga and Kansas. Star power can win you a lot of games on its own. It’s crucial to be able to play a wide variety of lineups come March. Some matchups will force you to go small. Others will make you play big. Some games call for a slow pace; others, you’ll need to speed things up. 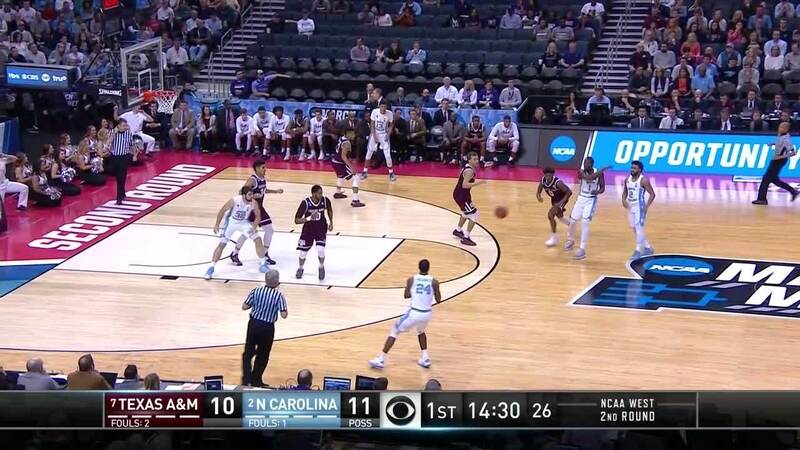 North Carolina should be able to play multiple styles effectively. When Maye, Johnson and Williams share the floor, as they usually will, North Carolina will have three elite shooters in the game. Pair Maye with a true center, and the Tar Heels could play volleyball off the glass. UNC would prefer to play at a fast pace. But because it has so many two-way players, it should be able to adapt to any style. This is a factor that doesn’t get emphasized enough, and it’s likely the reason why North Carolina isn’t grouped with the other teams mentioned. Top to bottom, North Carolina isn’t as talented as those rosters. Kansas, Kentucky and Gonzaga run 10 deep, while Duke has three potential superstars. The Tar Heels can’t say either of those things. But they have seven (possibly eight) players who are great fits in their roles. The offensive hierarchy is clear. Maye and Little are the top two options. Williams and Johnson don’t need the ball to be effective. Williams shot 40 percent from 3 last year; Johnson made 34 percent of his 3s, but he has a proven track record as a shooter. Defenses respect him. White projects as a perfect fifth starter as a freshman. It’s great that some of these schools have 10 guys capable of playing starter’s minutes. But is that really necessary? North Carolina won’t have to deal with that confusion. Also, it’s great to have three superstar-level talents, but again, is that really crucial? One could argue that a third option is more effective if his greatest talent is spacing the floor, not dominating the ball. Again, this is not to suggest that North Carolina is better than those teams. But its clear, sensible roster construction might get overlooked, and it’s something the Tar Heels have going for them. We know the puzzle pieces fit. The best teams usually have a combination of veterans and talented freshmen. North Carolina checks that box. Three of its four best players will be seniors in Maye, Williams and Johnson. Little and White are high-caliber freshmen. If the Tar Heels can get contributions out of sophomores Brooks and Manley, this team has an ideal blend of talent and experience. Junior guard Seventh Woods has the ability to contribute, too. Kansas and Gonzaga also have this going for them. Kentucky is more experienced than usual, but it only has one key senior in Travis. Duke is going to be extremely young. This is something to keep an eye on. North Carolina’s ceiling may not be as high as these teams’. But that in itself is probably its biggest weakness, which is a compliment. The Tar Heels' ceiling is high enough to win a national championship. But if R.J. Barrett, Zion Williamson and Cam Reddish are as good as advertised and a few role players shine, Duke will have the better season. If one of Kentucky’s freshmen becomes a superstar to pair with Reid Travis and the Wildcats can keep everyone in the rotation happy, Kentucky will be better. You get the idea. But North Carolina should be awesome on offense. It could lead the nation in offensive efficiency. And while it probably won’t finish first in defense, it will be good on that end. A top-15 finish is a reasonable expectation. That kind of balance will win you a lot of games. North Carolina is talented, experienced, well-balanced and well-coached. Don’t sleep on the Tar Heels in 2018-19.